The BP Portrait Award 2014, which opens at the National Portrait Gallery this week, might seem to some like the celebration of a dying art. In our digital age, portraiture might seem to be less and less relevant when you can just snap a picture of someone with a camera. Or, of yourself. The selfie has taken self-representation even further and made it even easier. So do we just have a traditionalist or nostalgic attachment to painted portraiture? This is not a question about the difference between painting and photography, but rather about what a portrait actually is and how it differs from other images. The first thing that distinguishes portraits is fairly obvious: they are images of real individuals, not generic figures or inanimate objects. The second thing, and the key point of definition according to the 18th century art theorist Roger de Piles, is that a portrait is an attempt to render that real individual so exactly, that the image encapsulates not only the physical traits of their body, but also the emotional traits of their soul. A portrait, in other words, is one person’s attempt to capture another person completely. So a portrait is essentially the trace of an encounter. When looking at a portrait – meeting the sitter’s gaze or surveying their body – we often feel a sense of intimacy or connection, because what we’re experiencing is someone else’s engagement with that person. We’re looking at a trace of their interaction – at how one person sees another person. This is very clear in the finalists for this year’s BP Portrait Award. Each portrait represents a human relationship. There is Thomas Ganter’s encounter with a homeless man on the street outside a museum, which won the prize. Richard Twose’s encounter with someone he saw on television, but got to know during their sittings, and David Jon Kassan’s encounter with his mother during a visit in his own home, were also shortlisted. No matter the style – expressive, realistic, or abstracted – a portrait is a dialogue between artist and sitter, and the image on the canvas a witnessing of the varying degrees of intimacy in these human conversations. Selfie – noun, informal; a photograph taken of oneself, typically with a smartphone or webcam and uploaded to social media. 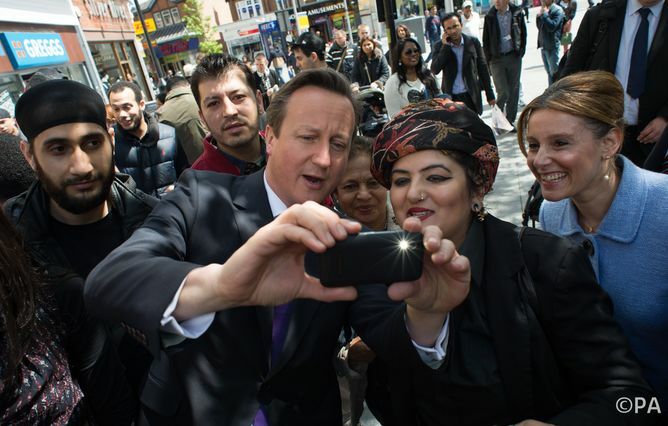 David Cameron takes a selfie. What has been fascinating about the rise of the selfie is that the definition turned it into a phenomenon. Immediately following the OED’s formal definition, a vague cultural practice became a category of representation. Something that teenagers were doing on social media became something that US presidents and British prime ministers did at meetings with heads of state (even when those meetings took place at funerals). Before selfies made the act of self-representation available to anyone with a smartphone, self-portraiture had been the preserve of artists alone. But while this sub-category of portraiture has a long history in art, the word itself is not nearly so old. According to the OED, “self-portrait” did not appear in the English language until 1831 – and in France, autoportrait did not make it into the Dictionnaire de l’Académie Française until 1928. When Sir Joshua Reynolds painted himself in his Royal Academy robes in 1780, or when Gustave Courbet painted his dramatically self-reflexive The Desperate Man in the 1840s, neither artist was painting a “self-portrait” (or “autoportrait”), per se. 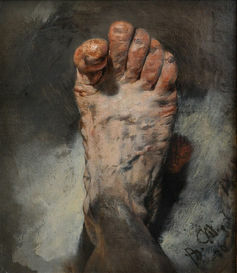 Adolph Menzel, The Artist’s Foot, 1876. But even before the term was coined, self-portraits were always different from portraits, just as selfies are different from other photos. If a portrait is a social encounter with another person, then a self-portrait is a perceptual encounter with one’s own body – and all the physical constraints that such an act involves. The physiological impossibility of seeing oneself has fascinated artists for centuries, inspiring ingenious works that play with these constraints (like Brett Whiteley’s mirrored reflection seeing himself seeing) or escape them entirely (like Menzel’s foot, where he attempts a true phenomenological experience of his own body). Even with the aid of a smartphone, these same physical constraints give the selfie that distinctive look, with its tell-tale signs of production – a head shot, often to the side of the foreground, sometimes with a bit of outstretched arm. But this is also exactly why the selfie has taken off. It has provided everyone with the opportunity to experiment with those physical constraints of self-seeing and self-representation, giving rise to the plethora of sub-sub-categories (belfies, welfies, shelfies, etc) that are all attempts to do with a camera what artists like Whiteley and Menzel did in paint. As digital technologies provide new scope for experimenting with acts of portrayal, selfie-ists have much to learn from painters of the past and present. Portraiture is clearly far from a dying art. The BP Portrait Award 2014 is showing at London’s National Portrait Gallery until September 21. Update: I recently changed my website and until I can update all the posts with images and what not, I wanted to add this 3d selfie experiment with digital media.